Using one of the most imaginative and unique styles of play in history, Bent Larsen stormed to the top of the world’s elite players. Willing to take risks and try unorthodox moves and plans, Larsen was a big proponent of the element of surprise, using it to confuse his opponents throughout his career. He was the first Western player to give a major challenge to the Soviet Union’s rule over chess. Larsen also had many wins over the seven World Champions who had their titles from 1948-1985. Bent Larsen learned to play chess around the age 7 and soon after he played in the World Junior Championship two different years. Despite these accomplishments, he didn’t start taking chess seriously until he was 17 years old. It was then that he decided to play chess professionally. He became an International Master at 19 years old in 1954 and in 1956 he acquired the Grandmaster title. Later in his career, he started to change his playing style a bit, going from being a solid player to the risky, unusual style that he is well known for now. He did this in order to throw his opponent’s off and this led to him developing a stronger overall game as well. 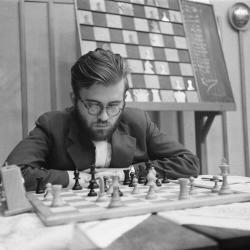 From 1965-1973 Larsen dominated tournaments around the world and placed better than many of the European players. Even with these great tournament placings, he never had the chance to play for a World Championship. Throughout his life he played in six Chess Olympiads for Denmark, representing them on board one every time. At the end of his life, he ended up passing away on September 9, 2010.